I learned yesterday that my good friend Sue Lyman had to put her long time partner Simbalu (chesnut, TB, stallion, 26 years old) down last week due to a shoulder injury. Sue and Simbalu were together for 22 years and during that time they did so many wonderful things not only for one another but for the hunter community as well. Sue and Simbalu found each other at the race track. Sue was exercising race horses and Simba’s racing career came to an early end due to an injury. Sue realized this horse had potential to be a great jumping horse and their partnership began. Not only did Sue do all of the training with Simbalu but she also handled him in the breeding shed. 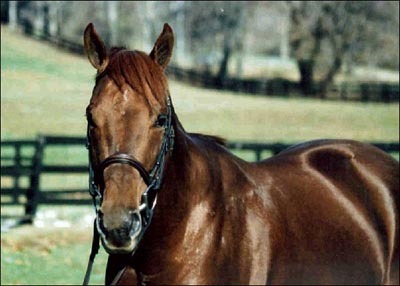 As a stallion Simbalu passed on to his get his fantastic mind. All of his youngsters are athletic, jump great and move well. But they all have his wonderful mind. They are brave horses like their father and kind to their owners. I worked for Sue in 1997 and had the privilege of working with Simbalu and his offspring. Simbalu had a very funny sense of humor and liked to keep his humans on their toes. Sue’s farm is in Middleburg, VA so we were able to take full advantage of the vast countryside. One beautiful summer day I was asked to take Simba out for a nice hack cross country. I off course said yes! Well, it was Simba who took me for a hack! We went where He wanted to go and we where out there until He wanted to come home. I couldn’t believe that horse! Sue laughed when I returned back to the barn. Now as I look back I realize Simba was teaching me a lesson. The lesson was to always be flexible and patient and to always be able to laugh at yourself. 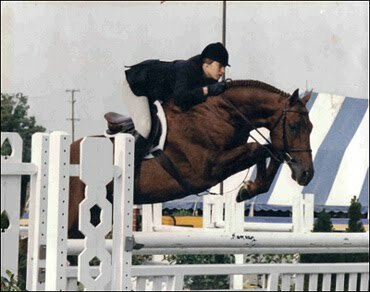 Another great memory I have is the first time I cantered this beautiful chestnut Thoroughbred to a jump. It was like floating on a cloud and in the air it felt like you were flying in the wind. He kept the same rhythm to every jump. And if you tried to change it he wouldn’t allow it as you were wrong. He made everyone around him feel like they were a rock star. The hunter world has been blessed to have had such a true hunter stallion influence the quality of young horses involved in the sport. Simbalu will be missed!